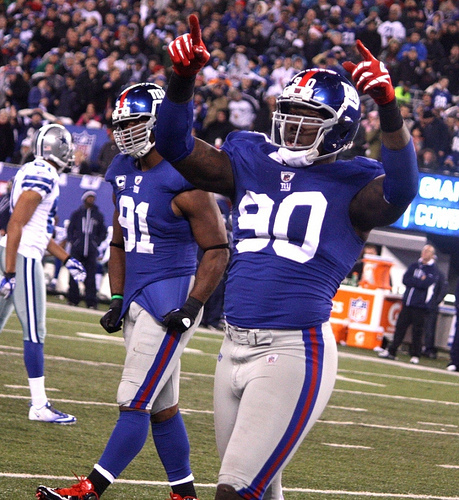 New York Giants defensive end Jason Pierre-Paul underwent surgery on June 4 to fix a herniated disc in his back. He suffered from lower back pain since last season, causing his performance to suffer. After multiple injections and core strengthening exercises failed to fully alleviate the pain, the 24-year-old decided surgery was the best option. As a result, Pierre-Paul will have a 12-week recovery, and that recovery period may take longer. He will miss the entire 2013 preseason, though it is hoped that he will return for Week 1 against Dallas. He is now in the early stages of recovery, and was back in New York in June. After a surgery such as Pierre-Paul’s, called “discectomy,” patients are encouraged to get up and walk around a few hours after surgery. Outpatient physical therapy usually starts 2-3 weeks after surgery, and Pierre-Paul is probably eagerly working away, trying to ready himself for the upcoming season. Physical therapy normally lasts from 6-8 weeks. While many can get back to work in a few weeks, manual laborers and athletes have a longer time off work. Full recovery is expected in 4 months, but Pierre-Paul hopes to be back on the field in 3. While physical therapy usually involves a patient relearning his or her life with safe back positions and habits, Pierre-Paul’s therapy will probably be more intense, as he is a football player and already much stronger than the average person. It’s the last year of his rookie contract, so he’ll be itching to get back on the turf. As he gradually gets stronger, he can add more and more of his daily routine back into his life. In order to be ready to play, he will have to exercise, targeting the muscles of his back to strengthen them. By working with a backpain doctor in NYC, Pierre-Paul can get back to where he was previously. He played an entire 16-game season in 2012 fighting back pain, so the team and fans can be sure he’ll fight hard to get back into shape. Giants coach Tom Coughlin was frustrated at the end of last season with Pierre-Paul, as his back problems caused him to get slightly out of shape. Of course it’s frustrating as an athlete to be out of the running due to surgery, but Pierre-Paul and the team look forward with hope that he’ll return at his full former strength.